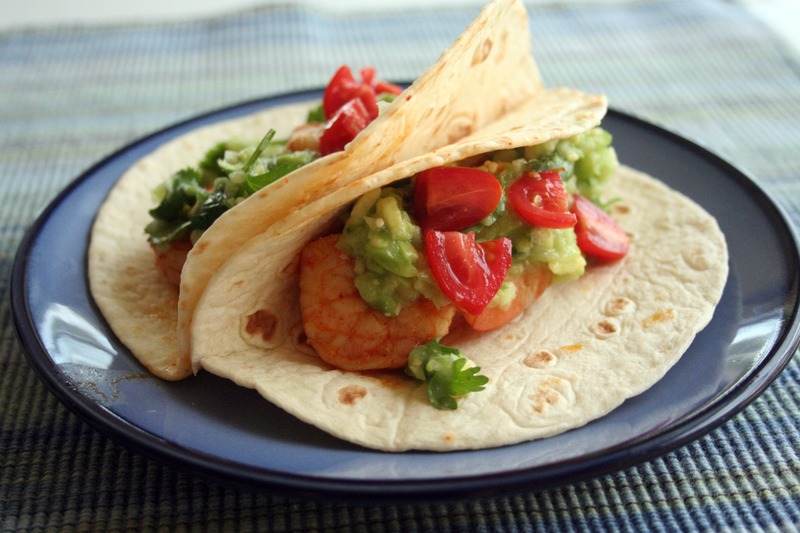 I bookmarked this recipe a long time ago but M didn’t get the whole “shrimp on a taco” thing. Woo – he was wrong because this was so good. I was a little worried about what the salsa verde would taste like because I’ve never had raw tomatillos. Normally, salsa verde’s are cooked down but this didn’t have any weird, raw taste to it. The salsa was an excellent compliment to this meal, and had the right amount of spice from the jalapeno. My family loves shrimp, so I bought one and a half pounds for this, which was more than what we needed. The shrimp is simply seasoned with the chipotle powder and some kosher salt; but I added a little chili powder, coated them in olive oil, and squeezed fresh lime juice over top all of them. Also, I didn’t grill these, but I sautéed them in a little olive oil and butter. Thanks for reading, enjoy! Heat a large skillet to med-high heat, then add butter and olive oil. Mix the olive oil, chipotle, chili powder, and salt in a large bowl. Add the shrimp, and lime juice then toss to coat.